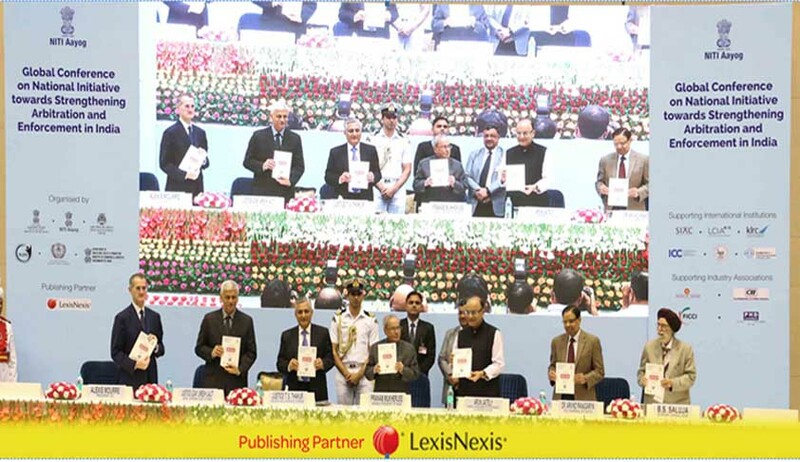 LexisNexis®, a leading global provider of legal and business information services and solutions, announced the release of ‘Arbitration Resource Book’, at the ‘National Initiative towards Strengthening Arbitration and Enforcement in India’ Conference at Vigyan Bhawan in New Delhi on October 21, 2016. Hon’ble Mr. Justice T.S. Thakur, Chief Justice of India and the Patron-in-Chief of the Conference, released the book and presented the first copy to Shri Pranab Mukherjee, Hon’ble President of India, during the inaugural function in the presence of other dignitaries like Shri Arun Jaitley, Hon’ble Union Minister for Finance and Corporate Affairs, Government of India; Dr. Arvind Panagariya, Vice-Chairman, NITI Aayog; Hon’ble Mr. Justice Uday Umesh Lalit, Judge, Supreme Court of India; Mr. Alexis Mourre, President, ICC; Hon’ble Mr. Justice Manmohan, Judge, Delhi High Court and the Chairman of the Organising Committee of the Conference; Mr. Amitabh Kant, CEO, NITI Aayog; and Mr. Mohan Ramaswamy, Managing Director, LexisNexis India-South Asia. “We at LexisNexis feel honoured and delighted to be a part of this major conference on arbitration and are thankful to the organising committee for giving us an opportunity to publish this Arbitration Resource Book under our Advancing the Rule of Law initiative, which is the broader purpose of our existence,” said Mr. Mohan Ramaswamy, Managing Director, LexisNexis India-South Asia.